The Argentine navy said a noise "consistent with an explosion" was detected just hours after one of its submarines disappeared Nov. 15. The Argentine navy said a noise "consistent with an explosion" was detected just hours after one of its submarines disappeared with 44 people on board. The navy lost contact with the ARA San Juan on Nov. 15. At the time, it was returning to its home port from a city in the southern tip of South America. On Thursday, a navy spokesman said a singular event that he described as "short, violent [and] non-nuclear" occurred roughly 30 miles north of the location the submarine was last known to be. The announcement comes after Argentina received a report from the U.S. saying a "hydroacoustic anomaly" was detected the day the submarine vanished. If the submarine is still intact, officials worry the vessel could soon run out of oxygen — if it hasn't already. 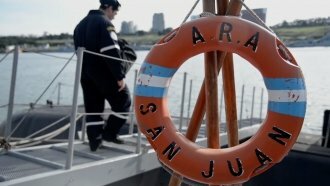 The Argentine navy previously said the San Juan has enough oxygen to last around seven days if it's submerged and can't raise a snorkel. Thursday marked the eighth day of no sign of the sub. Multiple countries are helping search for the submarine, including the U.S. Among other things, the U.S. Navy sent unmanned underwater vehicles, which use sonar to create an image of the ocean floor.